The Microsoft Hololens is one of 2017's biggest developments in the Virtual and Mixed Reality Scene. Still available predominantly to developers, the Hololens is "the first self-contained, holographic computer," adding all the benefits of mixed reality right into the user's actual view of the world. Consumers in Singapore are attracted to the mixed reality device for its endless possibilities. The most exciting difference between the Microsoft Hololens and other VR, MR, and AR devices that came out this year - at least in our opinion - is that the glasses go beyond adding 2D graphics to the world around you. The big pull is the virtual, interactive 3D models that can appear in your view, giving you an ultimate enhanced view of the world or even helping you design something totally new. To find out more about the benefits of the Microsoft Hololens, visit these hands-on reviews from Wareable, Tech Radar, and CNet. Who can buy the Microsoft Hololens (and who was it designed for)? 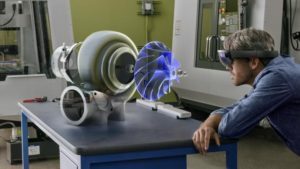 The Microsoft Hololens is still mostly marketed to developers, but many industries and companies are looking toward the new technology as an opportunity for fast growth and endless development. From surgeons, to construction workers, to the modern consumer who just loves gaming and mixed reality, the Microsoft Hololens is truly a device designed to enhance life for anyone and everyone. 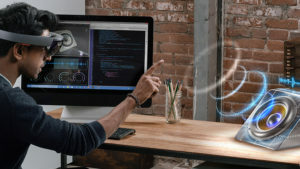 Interested developers always had to buy the Microsoft Hololens from the US, which prevented businesses and individuals in Singapore from being able to access the brand new tech. Until now. Whether you're a developer looking to get into the holographic app scene, a business looking to revolutionized your company and innovative possibilities for your employees, or just an interested tech enthusiast, you might find it difficult to buy the Microsoft Hololens in other countries like Singapore. Unfortunately, the USA Microsoft online store does not currently offer international shipping. However, Big Apple Buddy, your personal shopper, can help you buy products direct from the official USA Microsoft online store and ship them to your doorstep in Singapore. If you would like to buy the Microsoft Hololens, simply get in touch. We’ll get back to you with a free quote within 24 hours!